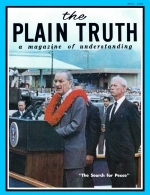 Here, in brief, is an on-the-spot report of Mr. Johnson's "Search for Peace" trip to Hawaii - its purpose, accomplishments and hopes. Honolulu, Oahu. From the moment AIR FORCE ONE landed at International Airport, Honolulu, Hawaiians expressed mixed emotions about the outcome of Mr. Johnson's meeting with South Korean President Park Chung Hee. A few challenged Mr. Johnson with shouts and placards: "We want peace anywhere any time." They were the "Peace Pickets" - members of the Hawaii Committee to End the War In Vietnam. Others - forming by far the majority- welcomed the President with a warm, Hawaiian-style, "ALOHA, MR. PRESIDENT!" But have you ever wondered just what the greeting "Aloha" means? Why do the Hawaiians use it so frequently?